Read this alongside the SDL Flow chart. 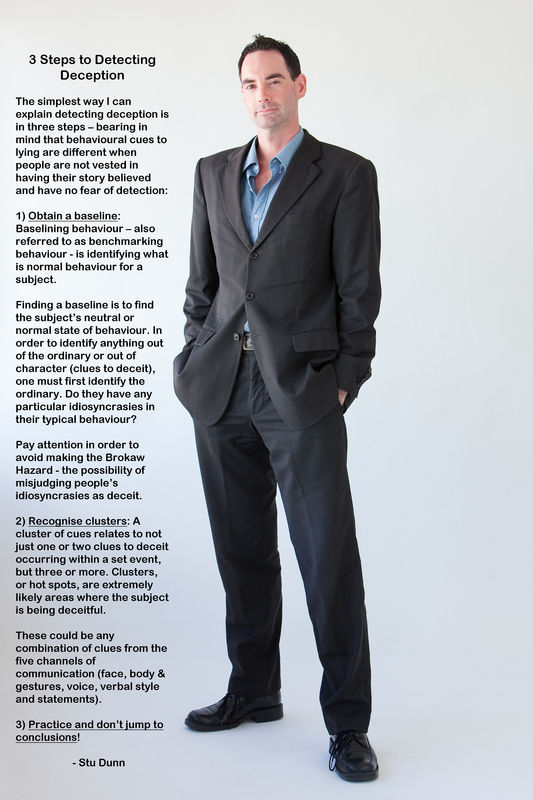 Due to research on the science of detecting deception through behavioural cues it’s possible for a trained individual to analyse behaviour – usually video footage, enabling thorough empirical investigation – and make an accurate assessment of an individual’s truthfulness (Frank, Feeley, Servoss, & Paolantonio, 2004). Although there are behavioural cues to lying, there is no single sign of deceit itself. “Nonverbal communication and lying are more complicated by the fact there are no clear-cut guaranteed clues to deceit” (Frank & Svetieva, 2012). What do I mean by deception? I personally like definition of deception (or lie) that Pamela Meyer (2010) draws on from the combined works of Vrij, Ekman and DePaulo. The definition is; a lie is a message knowingly transmitted to another person with the intent to foster false beliefs or conclusions and without prior notification of purpose. So – other than becoming a trained individual – how do you learn to detect deception in your workplace, home environment, and general day-to-day living? The simplest way I can explain detecting deception is in three steps – bearing in mind that behavioural cues to lying are different when people are not considered in having their story believed and / or have no fear of detection (Ekman, 2009; Matsumoto, 2011). Baselining behaviour – also referred to as benchmarking behaviour – is identifying what is normal behaviour for a subject. Finding a baseline is to find the subject’s neutral or normal state of behaviour. In order to identify anything out of the ordinary or out of character (clues to deceit), one must first identify the ordinary. Do they have any particular idiosyncrasies in their typical behaviour? Other normal behaviour clues are also important, including gestures, voice, and verbal style. The start, however, is always to focus on facial expressions, because the research has demonstrated that these are involuntary reactions and thus important nonverbal cues to deception (Frank & Ekman, 1997). Expressions are likely to be false when they are asymmetrical, the duration of expression is either too long or too short, or the timing of the expression in relation to the speech is not synchronised (Ekman, 2009). A mistake referred to as the Brokaw Hazard – the possibility of misjudging people’s idiosyncrasies as deceit – can be avoided if a baseline is obtained (Ekman, 2009). A cluster of clues relates to not just one or two clues of deceit occurring within a set event, but three or more. Clusters, or hot spots, are extremely likely areas where the subject is being deceitful (Ekman, 2009). Clues to deception emerge through detection apprehension (fear of being caught), deception guilt (guilt about lying to the target) and duping delight (delight at having a lie believed). These clues generally increase if the stakes are high if they’re caught, appearing as leakage across any combination of the five channels of communication; the face, body & gestures, voice, verbal style and statements (Matsumoto, 2011). STEP 3) Practice and Don’t Jump to Conclusions! Because micro expressions, other facial expressions of emotion, and cues in verbal statements are subtle, they typically require focused attention to detect, and practice. In many situations, the investigator is primarily focused on the story being told, and not so much how it is told and what is being shown when it is told. Multi-tasking has been shown to reduce accuracy of deception detection (Ophir, Nass, & Wagner, 2009), which challenges investigators who aim to do more than just be aware of expressions. Individuals trained in detecting deception can make mistakes, with human beings being unpredictable, each having the possibility of acting individually within any given situation. Common errors that occur by the lie catcher could be disbelieving-the-truth, where the lie catcher mistakenly judges a truthful person to be lying. A version of this is the Othello Error – also referred to as a preconceptions or confirmation bias – which is a disbelieving-the-truth error where the interviewer fails to consider that a truthful person who is under stress may appear to be lying. To put more simply; the Othello Error is a truthful subject fearing being disbelieved (Ekman, 2009). A final error that I’ll note to be aware of is believing-a-lie; where the lie catcher mistakenly judges a liar to be truthful (Ekman, 2009). Ekman, P. (2009). Telling Lies – Clues to Deceit in the Marketplace, Politics, and Marriage. W.W. Norton & Company, Inc., New York, NY 10110. Frank, M. G. & Svetieva, E. (2012). Deception. Nonverbal Communication: science and applications. 121-144, SAGE Publications, Inc, California 91320. Frank, M. G., Feeley, T. H., Servoss, T. N., & Paolantonio, N. (2004). Detecting deception by jury, I: Judgemental accuracy. Journal of Group Decision and Negotiation, 13, 45-59. Matsumoto, D. (2011). Evaluating Truthfulness and Detecting Deception. FBI Law Enforcement Bulletin, June 2011, US Department of Justice. Meyer, P. (2010). Liespotting – Proven Techniques to Detect Deception. St. Martin’s Press, New York, NY. 10010. To view SDL’s Online and 2-Day training and consulting services, please visit the services page. This entry was posted in Evaluating Truthfulness and Credibility and tagged detecting deceit, ekman, matsumoto, sdl, stu dunn. Bookmark the permalink. People-watching just got more stalkery and worthwhile methinks.